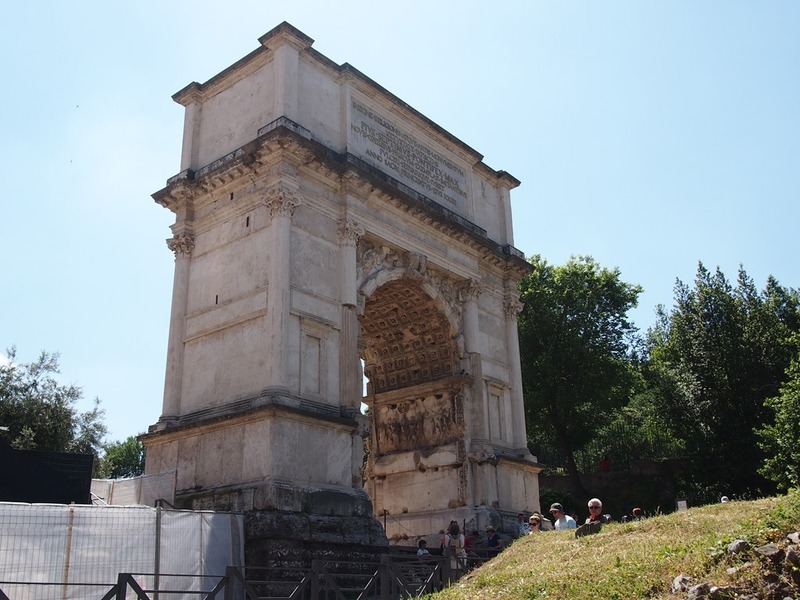 I decided that my first full day in Rome should be devoted to Ancient Rome and its inhabitants – and what better way to do that than a visit to the sites of the Colosseum, the Forum and the Palatine Hill? All three sites can be visited on a single ticket, costing €12. Strolling down to the Colosseum (for one could barely do much more than stroll in the crowds), I couldn’t help but pity the Romans who have to live with this on a daily basis. I had already noticed, at truck stops and in my dealings around Italy, that Italians could be very pushy and my experience in Rome has done nothing to dispel this notion. 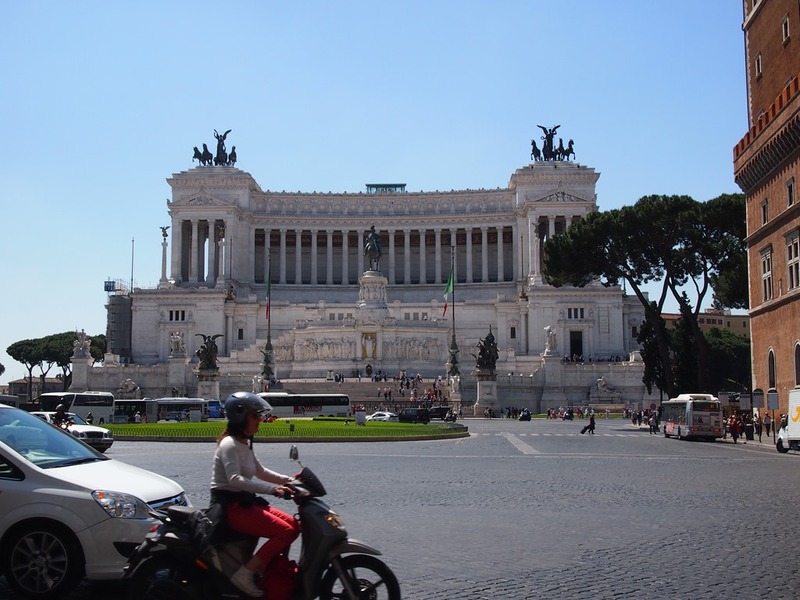 The walk down brought me past the Piazza Venezia, famous for its enormous white “National Monument to Vittorio Emanuele II”, the king of a unified Italy. The construction of the monument commenced in the late 1800’s and required the destruction of an old medieval neighbourhood, making it a less than popular site for the people of Rome. I later did a walking tour and the guide further reinforced this fact, stating that the Romans knew what they had lost in the construction and that the monument wasn’t worth the price. It is impressive, albeit slightly tacky, with gleaming white marble and immense statues that don’t really fit into the rest of the neighbourhood’s muted colour scheme. 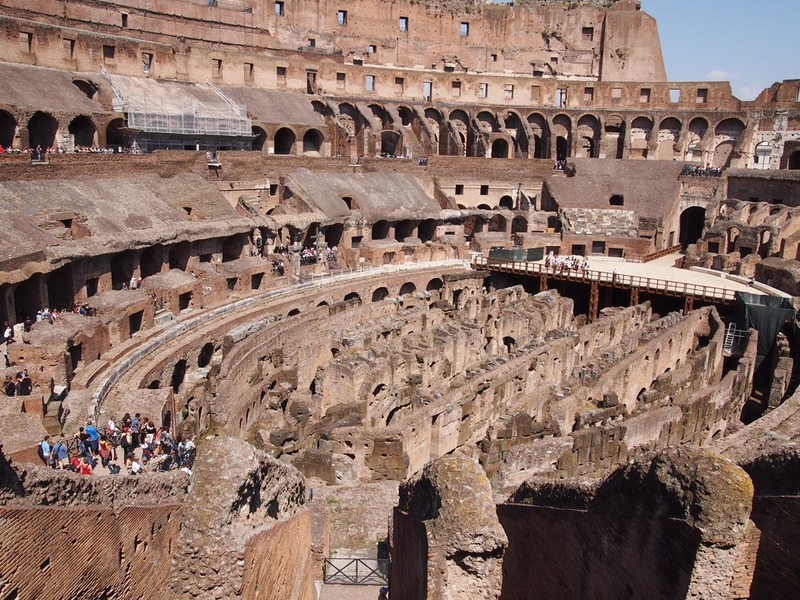 The Colosseum, as many know, housed the gladiator battles and wild beasts that helped to make Rome famous. The Forum was the former centre of the city, containing temples, the Senate and the ruins of several villas and markets. 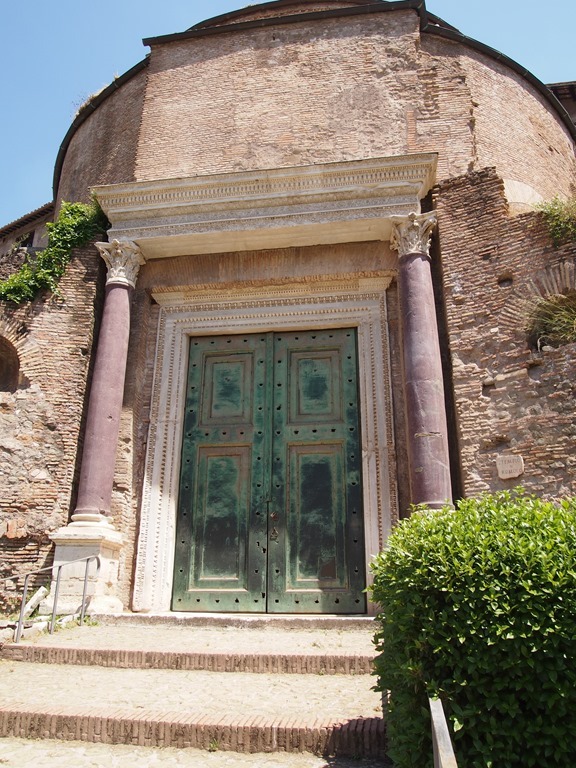 Palatine Hill, meanwhile, was the former home of the Emperor’s residence and those of the most powerful in the city. A rather sprawling site, the advice a tourist often hears is to buy their entrance tickets at any of the Forum/Palatine Hill entrances as the wait at the Colosseum can stretch for over an hour. I had assumed that everyone knew this advice by now but a quick observation of wait times at the Colosseum and then at the Forum/Palatine Hill proved that Google is apparently not everyone’s friend. There is an option to rent audioguides at each of the sites, for a cost of around €5 each, but I had already paid €12 to enter and am trying to complete this trip on a budget. Enter: Rick Steves and his Audio Europe app! 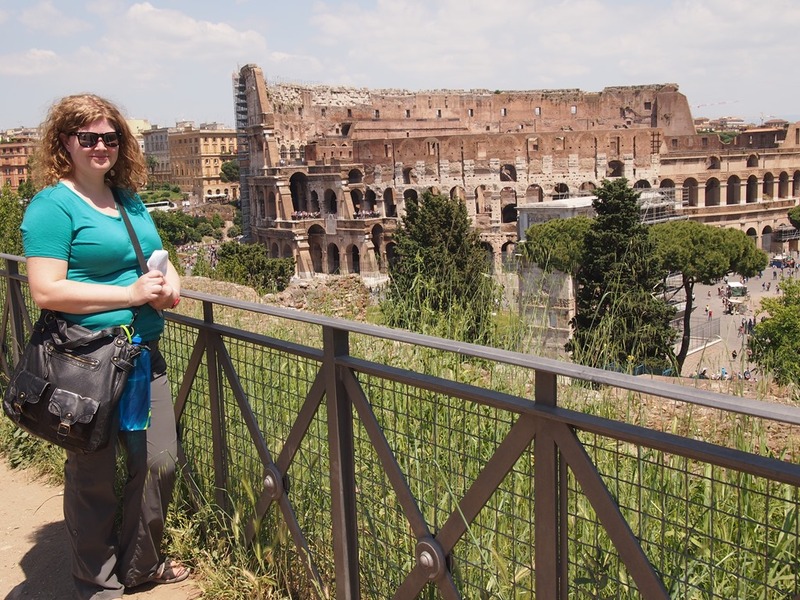 I had downloaded his Forum and Colosseum walking tours the night before onto my iPhone, using the wifi connection at the hostel, and now had free walking guides ready to go. The app, as opposed to the iPod option, includes photos of each of the sites and a map of the walk in case you get confused. And the Forum is confusing – it’s basically a bunch of rubble with a few informational plaques. I think an audio guide, whether Rick Steves or the paid one from the site, or a detailed written guide, is essential to really understanding this site. A lot of the buildings in the Forum were repurposed after the fall of the Roman Empire. Some were turned into Christian churches, honouring one God as opposed to the hundreds that were worshipped by the Romans, while others had their materials carted away to be used for the construction of different buildings. There was a bit of a building blitz in the 8th century, but by the 13th century these buildings were once again dismantled and the Forum basically became a dump for building debris. Not the most dignified purpose, and one that the ancient Romans probably didn’t see coming. 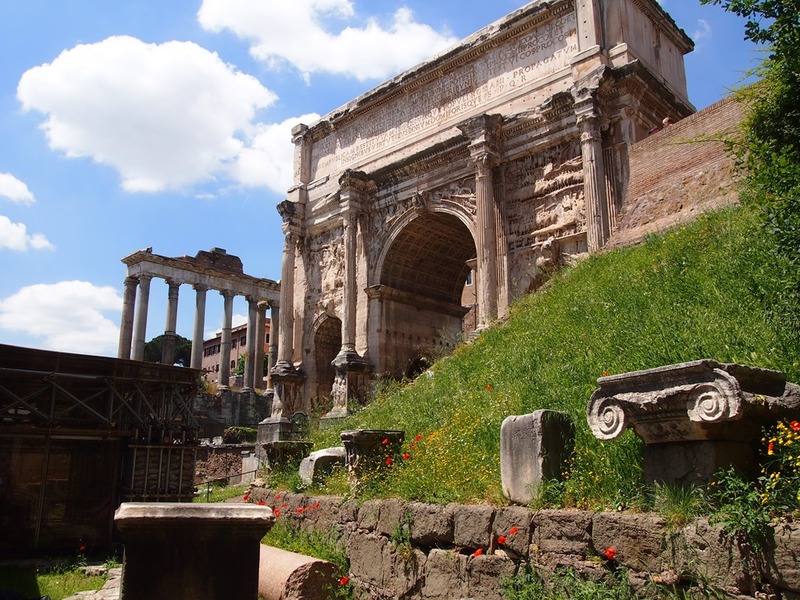 The excavation of the Forum really only finished in the 20th century and there are still ongoing archaeological expeditions. One of the routes I was trying to take was, unfortunately, blocked off by one of these archaeological ventures. Finally – Julius Caesar was apparently killed on the steps of the Senate, but it wasn’t the Senate building that is located in the Roman Forum (which was, unfortunately, closed on the day of my visit). Apparently the Senate was meeting elsewhere that day, so the site of his assassination was across town. 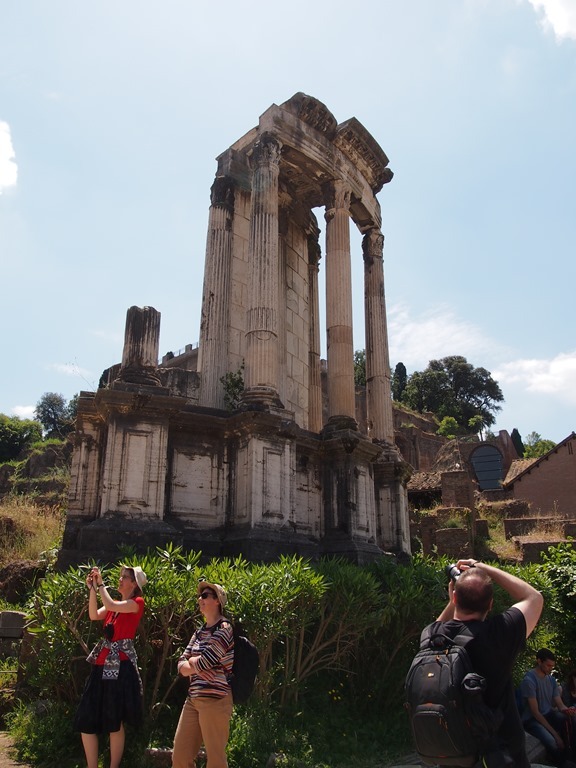 The ruins of the temple dedicated to Julius Caesar has what appears to be a mound of dirt that people throw coins or fresh flowers on to remember the ruler – but good luck getting a photo, because it was a crush of people trying to get inside. There was no Rick Steves audio tour for the Palatine Hill, which is unfortunate. I’m not sure if the €5 audioguide covered it, but it’s a fairly massive site, located straight uphill from the Forum. 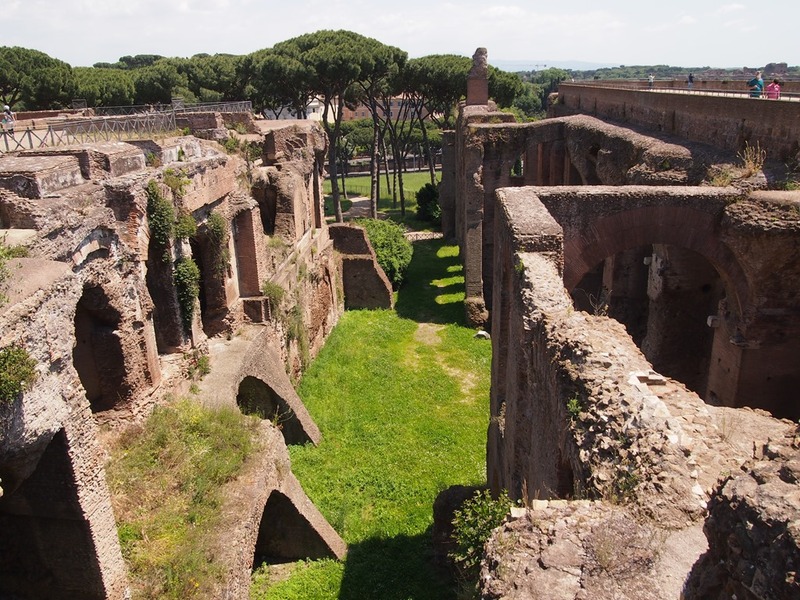 I’ve read before that the Palatine hill shouldn’t be considered a priority as the Forum and the Colosseum are more historically important, but the uphill walk was worth it for the views of the former Circus Maximus and the Colosseum. Circus Maximus was the former home of chariot racing and is now, quite simply, a big grass field. I met someone in the hostel the night before who told me he went all the way down there, expecting something amazing, only to be greeted with a big grass field. 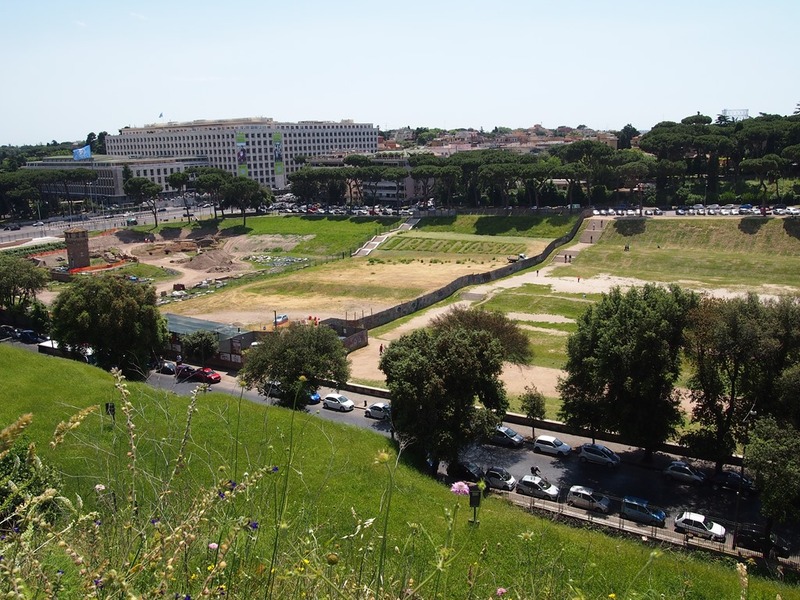 Circus Maximus… a large field. The Colosseum was, unfortunately, covered in a bit of scaffolding. I understand the importance of protecting national historic sites, but I can’t help but be a bit disappointed that I didn’t get the famous view that everyone else seems to! Although, I could buy an overpriced postcard from one of the dozen of vendors outside if I really felt the need to. I had been warned of security procedures, but there seemed to be none in place. I followed the line for ticket holders, smugly proceeding past the people standing in the massive line to buy tickets and entered without so much as a second glance. It was painless. I followed the visitors arrows and ended up on the second floor, where I had a chance to peruse the temporary exhibition and look at some of the artifacts that were removed from the site. Venturing out into the arena, however, it was exactly like I imagined with ruined walls, a mess of tunnels below and a small reconstruction of the arena floor. Visitors are allowed to freely wander, with a few areas gated off, but if you want to visit the basement level or the third level you need to sign up for a guided tour. I couldn’t really see how to do that, or the prices, so I didn’t bother – I knew the history of the site and had heard what I could find underneath but I was satisfied with my visit as is. The Colosseum could hold over 50,000 spectators and I assume they must have been sitting quite tightly. I was also surprised to learn that before reconstructions (there was a fire in 217 AD, and even after its initial construction Emperor’s loved to put their own stamp on things), the Colosseum’s arena could apparently be flooded in order to create mock sea battles for the amusement of the public. 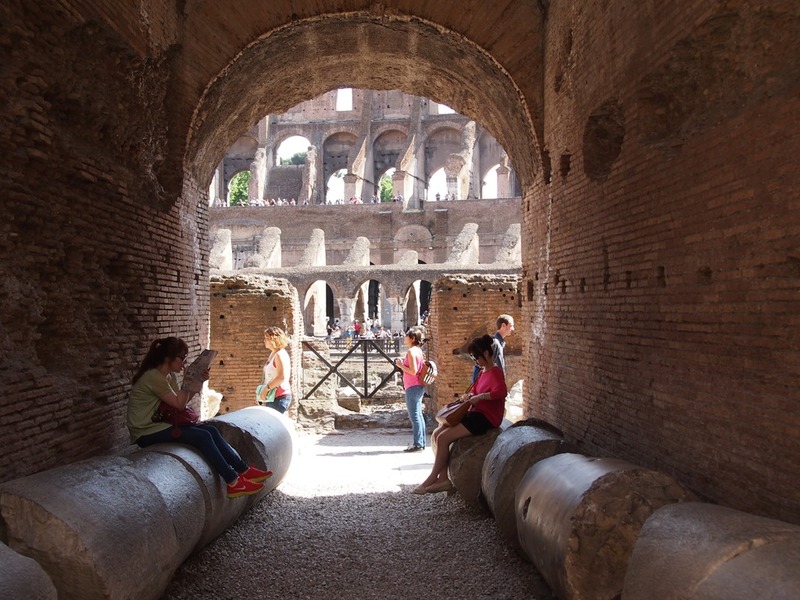 The upper floor of the Colosseum displayed some of the animal bones that were found on the site and it was interesting to see just how many exotic animals made their way to Rome 2000 years ago. 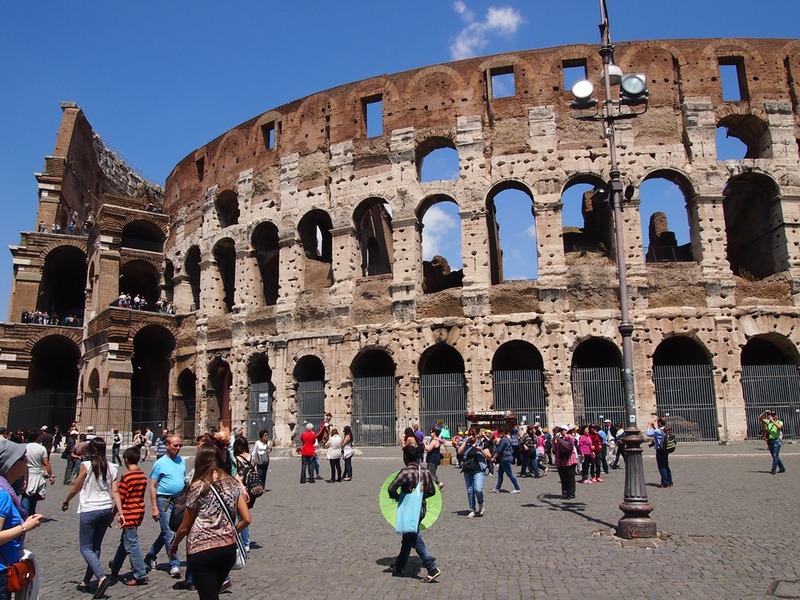 In the mid 1700’s, the Pope stated that the Colosseum was a sacred site where Christians had been martyred. This statement has yet to be proven as there are no historical statements, documents, pictures or even stories that provide evidence of his claim. nothing better than a rest on former giant columns! 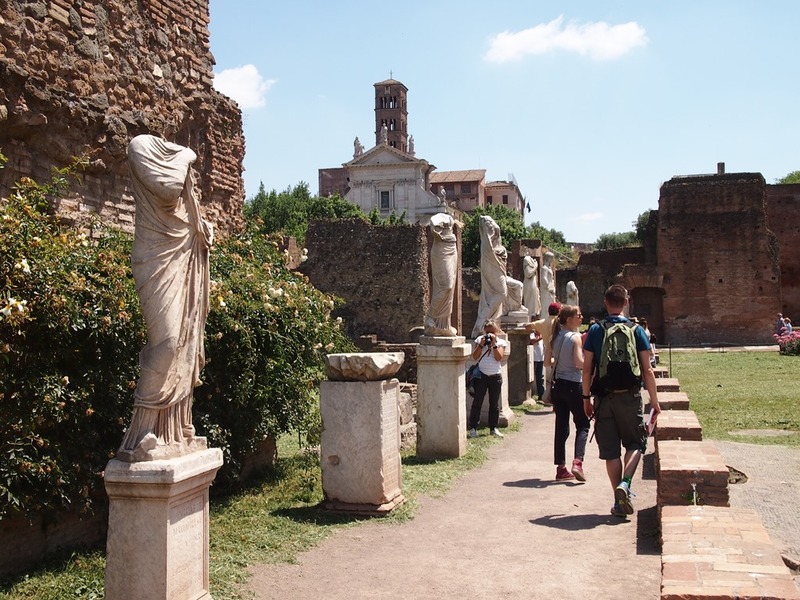 The best part of visiting the inside of these sites, instead of just walking around the perimeter or peering over the rail into the Forum, is that not only do you get to really walk along ancient footpaths and aisles, but you also get a bit of peace and quiet. It’s a little bit ironic, I think, that in the Forum which was the ancient marketplace of Rome, no one is trying to sell you anything – but venture outside the gates and all bets are off! Also, for those wondering – the bathroom in the Colosseum is a big trailer that they drove in and parked on the first floor. I suppose it’s better for historical preservation than trying to run plumbing throughout a 2000 year old structure.